Family members and others that need to obtain a burial permit may do so either by mail or in person at our location at 340 N. Mt. View, San Bernardino, CA 92415-0038. An original transit permit or certified copy of the death certificate is required along with the fee in order to receive the permit. Please contact our office at (909) 381-8990 for additional information during regular business hours, Monday-Friday, 8:00 AM – 5:00 PM. 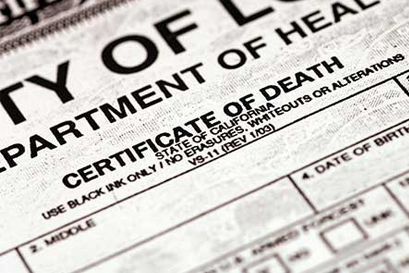 The burial permit is prepared at the time of filing of the death certificate within the Electronic Death Registration System (EDRS) with cooperation of doctors, hospitals, coroner, and mortuaries, and filed prior to disposition of the deceased. After-hours filing is available on weekends and holidays for the immediate filing of death certificates and burial permits. There is a fee for all after-hours filings and the need for emergency filing must be demonstrated (e.g. religious reasons, shipping out of the country). The mortuary must ensure that the death certificate and burial permit are completed in EDRS, and ready for acceptance by the local registrar (our staff). Mortuary staff may then call the number below to request filing on an emergency basis (must state reason). Our staff will assist with the completion of the filing. Please note that the Emergency Filing Fee will apply. Saturday, Sunday, and all County Holidays. Only active after hours. For mortuary use only.